Stamp till U Cramp: The Altered Alice: Week 1 - CHAPTER 12 Challenge: Hearts! The Altered Alice: Week 1 - CHAPTER 12 Challenge: Hearts! Since February contains Valentine's Day, The Altered Alice is challenging you to show us your HEART (or hearts), in whatever form you'd like to interpret that! 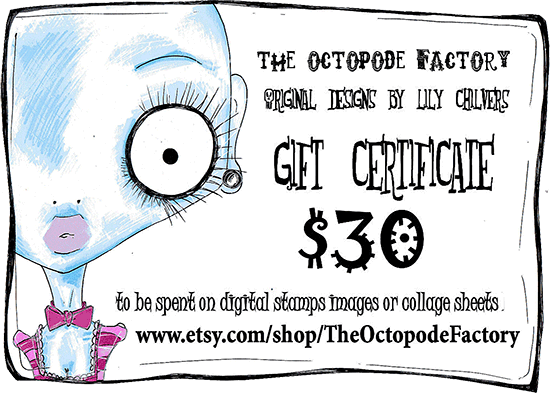 Our sponsor this month is The Octopode Factory, who is offering a $30 Etsy shop gift certificate to one randomly selected winner. The Octopode Factory has amazing and unique images born from the fertile imagination of Lily Chilvers. The Etsy Shop carries her digi stamps and collage sheets, and she has large and small rubber stamps available through her blog. Be sure to check out all the incredible Alice in Wonderland characters and digital stamp sets, and visit! And for fun and inspiration, be sure to visit Lily's blog and The Octopode Factory Friday challenge blog, or TOFF for short! This is a very short month, so you have only until Friday, Feb. 24 to submit your entry! As always, projects that feature Wonderland will have two chances at the prize instead of one. Multiple entries are fine, but each must be on a separate post. Please join us here. This is a very short month, so you have only until Friday, Feb. 24 to submit your entry! Scrapbook Page - Whatcha Doing?